Please join us for a free screening and discussion on Sunday, April 15, 1 p.m. at the Clyde Theatre, on First Street in Langley. We welcome your participation in the discussion after the film, especially from people living on Whidbey Island. Please let friends and contacts know about the screening. Expanded military budgets and increased activities at bases across the U.S. are challenging health, safety, and quality of life. 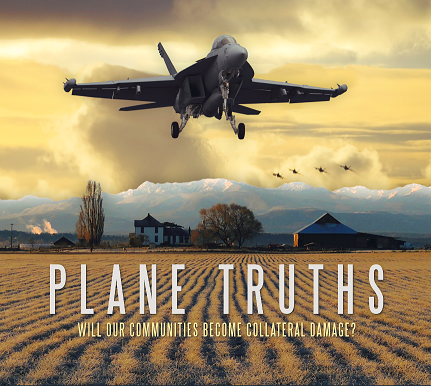 PLANE TRUTHS, a new documentary by Clinton filmmakers Mark Dworkin and Melissa Young, examines the community impacts of US Navy expansion in northwest Washington State and the people who are speaking out. Community members on Whidbey Island, the San Juans, and the Olympic Peninsula are disturbed by an increase in noise caused by new EA-18G “Growler” jets based at Naval Air Station Whidbey (NAS), and a significant proposed expansion of daily Growler test flights. On Whidbey, communities have been additionally impacted by water system pollution caused by chemicals used for firefighting on NAS landing strips. Currently the Navy is proposing to train Navy Seals in state parks. Hey, if you people are going to post pictures of us, can you at least show us in proper formation? No fighter pilot would allow himself to be as out of position as dash-3 in that formation. Sorry, but we would look much better than that. By the way, the new omnibus bill has funding for even more F/A-18E/F and G aircraft – all plumbed as Growlers. Wonder where they’re going? It’s not our photo, it came with the movie announcement. You can suggest changes to Moving Images if you like. Of course COER has events when there is NO public transit on Whidbey – either fixed-route or paratransit. Please when you’re ready to walk the walk of environmentalism and take a bus, wake us up.